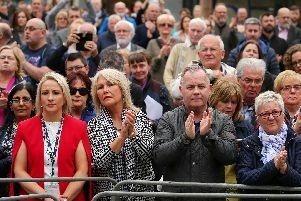 A man who lost his wife in the Shankill bomb has used the 25th anniversary of the outrage to appeal to Northern Ireland's politicians to get back to Stormont. Alan McBride's wife Sharon and father-in-law Desmond both died when an IRA bomb detonated inside a busy fish shop in October 1993. They were two of nine victims killed in the blast at Frizzell's fish shop on Belfast's Shankill Road. One of the IRA bombers also died. Ahead of a church service on the Shankill to mark the anniversary, Mr McBride reflected that five years after the bombing Northern Ireland's politicians came together to sign the historic Good Friday peace agreement. He suggested the current generation of politicians lacked the same leadership qualities. Northern Ireland has been without a properly functioning devolved government since the DUP/Sinn Fein led coalition imploded in a row over a botched green energy scheme in January 2017. The rift subsequently widened to take in more traditional disputes over language and legacy and there appears no immediate prospect of a return to powersharing, as the region's rudderless public services struggle to operate amid the impasse. Mr McBride said the political leaders of 1998 "risked their own interests, their parties and potentially their lives for the sake of putting an end to conflict". He added: "Where are those kind of leaders today?" Mr McBride's daughter, Zoe, who was two when her mother was killed, is due to deliver a reading at today's service at the West Kirk Presbyterian Church. "On this day, 23rd October 2018, twenty five years after the death of my wife, I implore our politicians to get back into government," he said. "The Agreement didn't have much to say on victims, but it did say that 'the achievement of a peaceful and just society would be the true memorial to the victims of violence'. "I believe that's still the goal and I want you to work together to deliver it."